We got these two during Cloud’s baptismal when he was 3 months old and just opened when he reached 7 months old now that he can sit on his own. We opened them both at the same time so he has two choices and to maximize their uses. I know these two costs 3,000php above but will update this entry as soon as I have the exact amount. Chicco has a bigger and heavier packaging than Fisher Price. For the assembly, I find Chicco easy to assemble as the wheel part are pre assembled so you just insert it on the front frame until you hear a “click” when is slides properly into place. You don’t need tools for this which is a plus. ON Button. Chicco’s on button is located just on the left side of the front frame which is very accessible while FP is located at the back. Chicco has a wheel lock (see below picture) to stop the rotation of the rear wheels. Fisher price has none. So now let us check their features one by one. 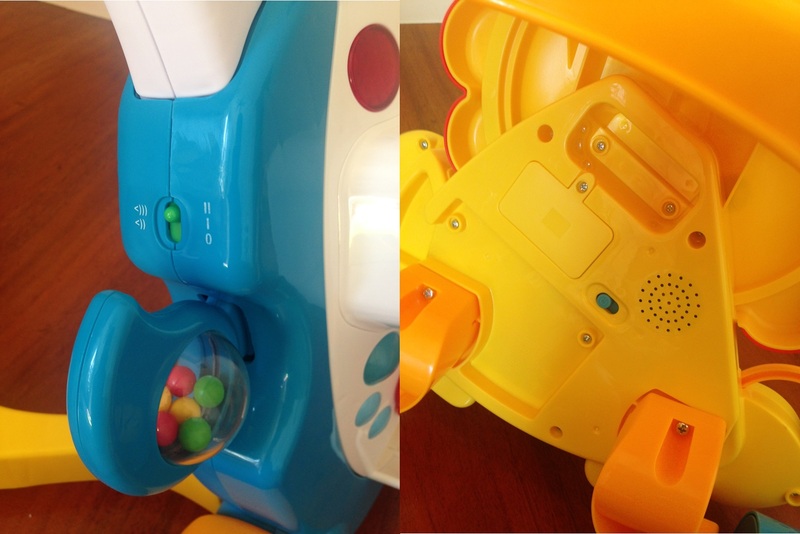 As the toy is pushed forwards, an entertaining tune is played, if baby stops, the music also stops and and this encourages him to keep going. This first steps also has an activity centre with lights, sounds and lots of play activities, these entertain and amuse baby whilst stimulating his movements, visual and hearing skills and also logical association ability. 1. Slots for the playblocks: baby slots in the blocks which fall through a special channel into the basket at the bottom. When the blocks are moving, they trigger a lively sound and light effect. 2. Left side activity: moving it forwards or backwards will activate a funny sound effect. 3. Right side activity with mirror: moving it forwards or backwards will activate a lively tune and a light effect. 4. Sliding fish: when the fish is moved it activates a funny side effect accompanied by flashing lights. Gross motor: Lights dance and music plays as baby pushes lion along, encouraging baby to walk. Fine Motor: Spin, flip, press! Lots of busy hands on activities will help strengthen fine motor skills. Sensory: Lights, music and hands on fun stimulate baby’s developing senses of sight, sound and touch. Balance and coordination: Sitting up for play, or standing, walking and pushing the lion along, helps baby develop balance and coordination too! So far Cloud is enjoying these two and these will be his buddy until he gets to know how to walk on his own. I hope I helped you out in choosing walker for your little ones. I agree, I prefer the Fisher Price's look. It's so cute! The lion seems like a lot of fun with more activities. But, I do prefer a toy to be easy to assemble. How about you? Which one do you prefer? I like fisher price toys! They're very sturdy! I still prefer the lion even it's a bit hard to assemble as it has better structure than the penguin. The penguin looks brittle and lack of support unlike the lion. Nice guide for new mums! You know, I regret not knowing about push type walkers before. We bought the usual kind and it didn't help my son learn to walk at all! My nephew used to have this and it's indeed very interesting. So cute! Very detailed comparison here. 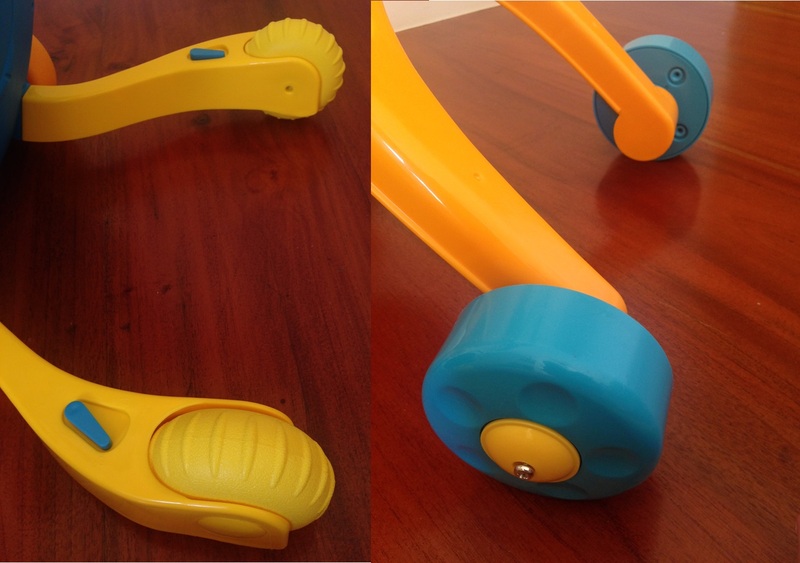 This is very useful for mothers with children who are in this particular age of training to walk. Awww! Lo still uses the old kind of walker because the push walker is too old for him to use. You are right mommy, we saved a lot from buying these push walkers. I know these are very expensive compared to the old kind of walker. Thank you! I like the Fisher Price 🙂 My children also used walkers similar to these, but I don't know the brand. It can be transformed into a table na rin. Chicco is quite an expensive brand but very durable, and easy to clean. Yung mga toys ng anak ko puro naipamana na sa mga smaller kids.